We all now how important backups are on our Macs or PCs and your Windows Phone is no different. You have a lot of data on there – Apps, pictures, files, etc – that if you lost, you would be frustrated at best and heart broken at worst. Microsoft has made it quite easy to backup your Windows Phone, leveraging your OneDrive account to have a cloud-based backup of your phone that can easily be restored. This How To is based on Windows Phone 8.1 so the screens may look slightly different if you are running an older version. I’m assuming that you already have Photos + Videos being backed up automatically to OneDrive through the Photo + Camera application settings. If not, do yourself a favour and enable it. This will assure that every time you take a photo or video it is uploaded automatically to OneDrive so you don’t ever lose it. 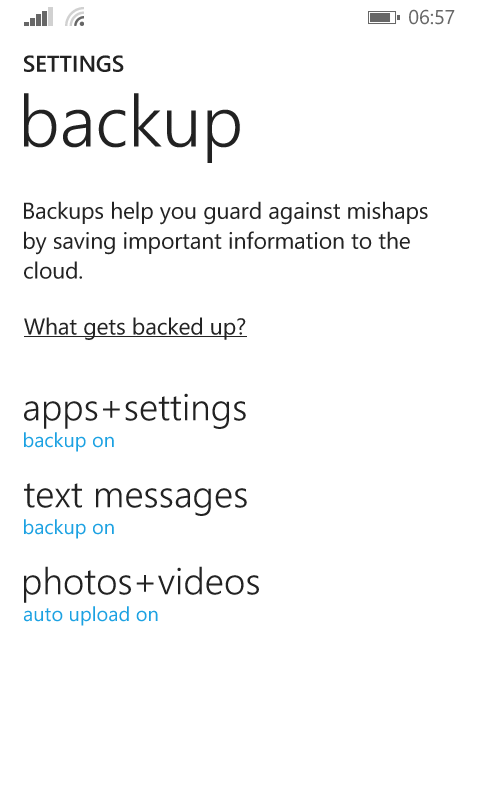 Apps + Settings, as the name suggests, backs up key information for you when you backup your Windows Phone. You can adjust these by tapping the Apps + Settings on the backup page in Settings. Settings backs up things like browser favourites, your Start screen layout (although I’ve found this to be a bit hit-and-miss) and passwords to your OneDrive account. Apps backs up content of the apps such as high scores, notes and app settings to OneDrive. It does not actually backup the app itself as those will be restored by re-downloading them from the App Store automatically during the restore process. power and has WiFi available. 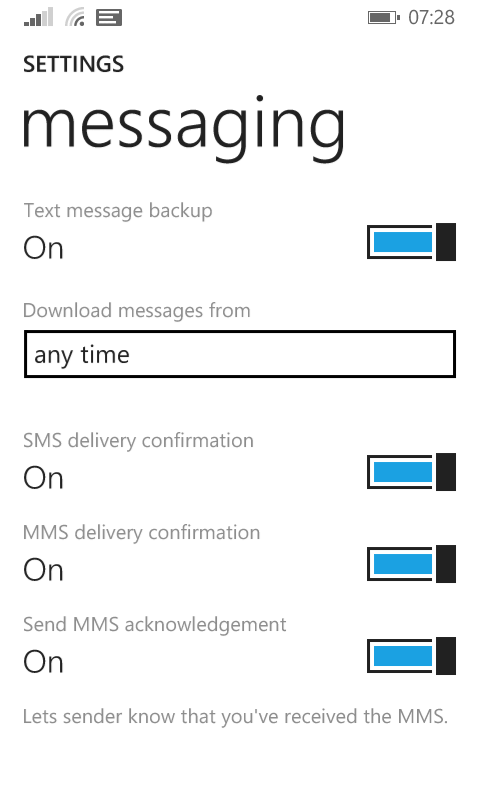 For Text Messages, backup will save all of those messages that you have received and sent from your Windows Phone. On this page you can also adjust delivery confirmations and acknowledgements for text messages received and sent. 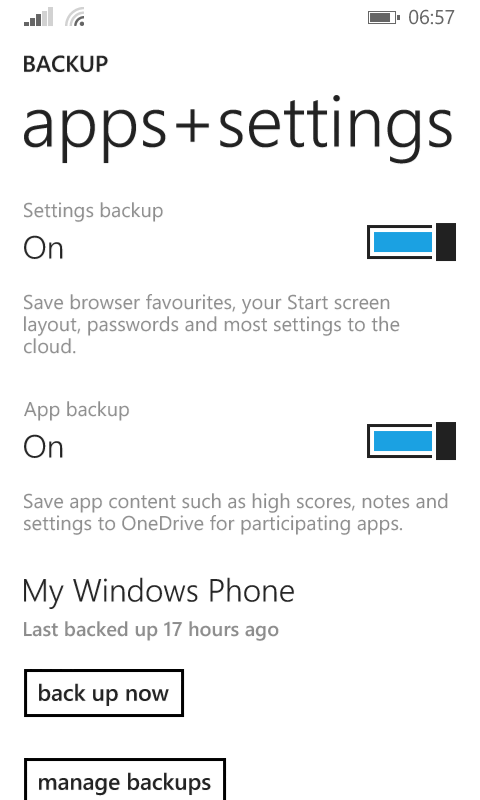 As you can see it is straight forward on how to backup your Windows Phone. The key is to make sure that you have it enabled so it can be performed for you automatically. As a best practice, I always recommend doing a Back up Now if you are going to be traveling and regularly during your trip to assure any settings, messages and photos you have taken are backed up in case the worst should happen to your Windows Phone.